As Inspector Alan Banks and his team scramble for answers, the inquiry takes an even darker turn when a truck careens off an icy road in a freak hailstorm. In the wreckage, rescuers find the driver, who was killed on impact, as well as another body—a body that was dead well before the crash. With In the Dark Places, I’d recommend a pint a pint or two of Theakston’s Old Peculier (yes, the odd spelling is correct). Be careful, though, as it’s a particularly strong ale. The good news is that it should be available in many parts of the USA, not only in the UK. In the early years of the modern brewing era, about two hundred years ago, many brewers produced a dark, strong ‘stock’ beer in the winter months, to provide a base amount of fermented beer to add to beers brewed in the rather more volatile months of the summer. Old Peculier probably owes its origins to this. The name pays tribute to the unique ecclesiastical status of Masham as a ‘Court of the Peculier’ and is also a reference to the strong characteristic of the beer. For many years, it was affectionately referred to as Yorkshire’s ‘Lunatic’s Broth’. Terry Gilchrist came out of the woods opposite the large hangar, which loomed ahead of him like some storage area for crashed alien spaceships in New Mexico. Only he wasn’t in New Mexico; he was in North Yorkshire. It stood at the center of a large area of cracked and weed-covered concrete, its perimeter surrounded by a seven-foot chain link fence topped with barbed wire. A large sign on the padlocked double gates read: private—keep out. About a quarter of a mile beyond the hangar, a passenger train sped by on the East Coast line, heading for King’s Cross. As he usually did at this point on the walk, Gilchrist let Peaches off her leash. The space was open far enough that he could easily keep an eye on her, and she always came back when he whistled or called her name. Peaches sniffed around the edges of the fence, and before long she had found a way in, probably the same hole the kids used when they went there to play cricket or smoke joints and try to feel up the local girls. This time, instead of continuing to sniff around the concrete and weeds, Peaches headed for the dark opening of the hangar and disappeared inside. While he waited for her to finish her business, Gilchrist leaned his stick against a tree, stretched his arms out to prop himself up against the trunk and started doing a series of simple leg exercises the army medics had given him. They were already pleased with his progress: out walking, albeit with a stick, after only four months, when they had at first thought the leg was as good as gone. But Gilchrist wanted rid of the stick now, and the only way to do that was to build up the damaged muscle tissue little by little. His leg might never look the same, but he was determined that it would function as well as it ever had. tone, and the whining went on for longer, but Peaches didn’t reappear. She wasn’t coming back. What the hell was wrong with her? Irritated, Gilchrist grasped his stick again and made his way along the side of the fence, searching for the gap Peaches had found. When he saw it, his heart sank. He could get in, of that he was certain, but it would be a difficult, and probably painful, business. And messy. He called again. Peaches continued barking and whining, as if she were calling him. To get the through the hole, Gilchrist had to lie flat on the wet ground and edge slowly forward, sticking his arms through first and pushing back against the fencing to propel himself forward. There was an immediate familiarity in lying on his belly that flooded his mind with fear, more a cellular or muscular memory than anything else, and he almost froze. Then he heard Peaches barking through the haze and carried on. Standing up was another awkward maneuver, as he could hardly bend his leg without causing extreme pain, but he made it, hanging on the links of the fence and using them as climbing grips. Finally, he stood panting and leaned back against the fence, clothes damp and muddy; then he grabbed his stick and made toward the hangar. It was dim inside, but enough light came through the large opening to make it possible to see once his eyes had adjusted. Peaches was standing about thirty yards to his right, near the wall; she was barking and her tail was wagging. Gilchrist made his way over, wondering what on earth was making her behave in such a willful and excited manner. Irritation slowly gave way to curiosity. The floor of the hangar was concreted over like the surrounding area, and it was just as cracked in places, weeds growing through despite the lack of light. He could hear rain tapping on the steel roofing and the wind moaning around the high dark spaces. He felt himself give an involuntary shudder as he approached Peaches. Even in the dim light, it was easy to see that she was sniffing around a dark patch on the concrete, but it took the light from Gilchrist’s mobile phone to see that what interested her was a large bloodstain dotted with chips of bone and chunks of gray matter. Immediately, an image of blood on the sand flashed into his mind and he felt the panic rise like the bile in his throat. 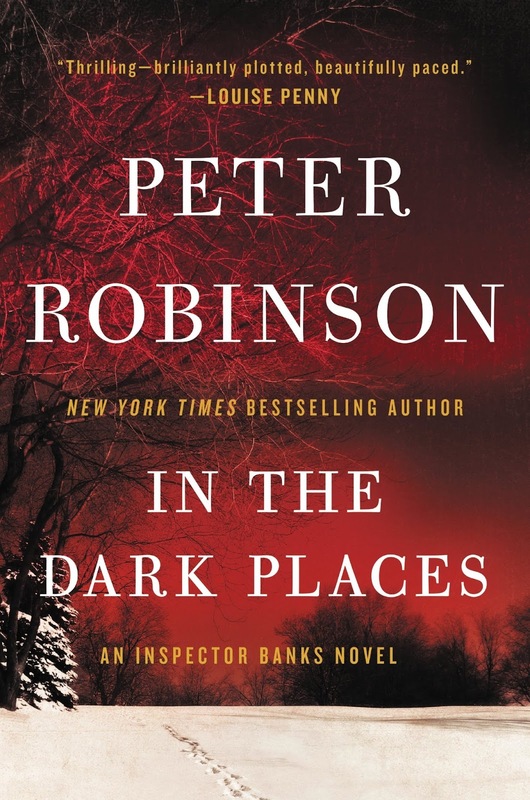 Excerpted from In the Dark Places by Peter Robinson. Reprinted courtesy of William Morrow/HarperCollins Publishers.